St. Martin's Griffin, 9780805087048, 224pp. Hurricane Katrina. A rapidly disappearing Arctic. The warmest winter on the East Coast in recorded history. The leading scientist at NASA warns that we have only ten years to reverse climate change; the British government's report on global warming estimates that the financial impact will be greater than the Great Depression and both world wars—combined. Bill McKibben, the author of the first major book on global warming, The End of Nature, warns that it's no longer time to debate global warming, it's time to fight it. Drawing on the experience of Step It Up, a national day of rallies held on April 14, McKibben and the Step It Up team of organizers provide the facts of what must change to save the climate and show how to build the fight in your community, church, or college. They describe how to launch online grassroots campaigns, generate persuasive political pressure, plan high-profile events that will draw media attention, and other effective actions. Fight Global Warming Now offers an essential blueprint for a mighty new movement against the most urgent challenge facing us today. 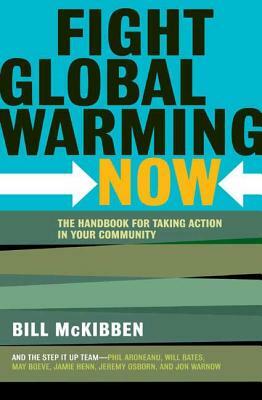 Bill McKibben is a founder of the environmental organization 350.org and was among the first to have warned of the dangers of global warming. He is the author of fifteen books, including the bestsellers The End of Nature, Eaarth, and Deep Economy. He is the Schumann Distinguished Scholar in Environmental Studies at Middlebury College and the winner of the Gandhi Prize, the Thomas Merton Prize, and the Right Livelihood Prize. He lives in Vermont.